This is inspired by my friend Rajan Parrikar’s post “Portraits of Success.” He references Carolyn Caddes‘s book, Portraits of Success – Impressions of Silicon Valley Pioneers (1986), which is a photographic tribute to the pioneers of Silicon Valley. Among those featured in the book is Prof Terman (1900 – 1982) of Stanford University who is identified as “the Father of Silicon Valley.” Two of his students, Bill Hewlett and Dave Packard, were the first to follow his advice to start up their own electronics company. Thus was Hewlett-Packard Company formed in 1938 in a garage in Palo Alto, CA. As it happens, I worked at HP in Cupertino, CA for a few years starting in the mid-1980s and even saw Bill and Dave in the facilities. 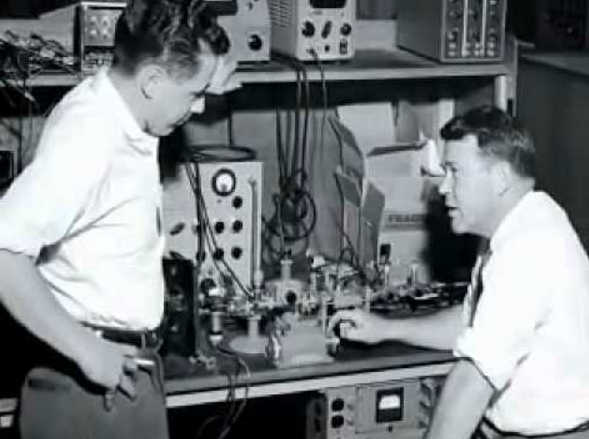 Another Silicon Valley pioneer featured is Prof John McCarthy (1927 – 2011). I never met him but one time I corresponded with him over email. He was a pioneer in the field of AI. Indeed he coined the term “artificial intelligence” in 1955. Rajan concludes with a reference to Indians in the Valley. The Indic traditions consistently warn against self-delusion and yet Indians are very good at deluding themselves (and I claim no exception to that.) Go see the portraits of some of the Silicon Valley pioneers in Rajan’s post. And of course, since this is an Ask Me Anything, you know what to do. Question – Any idea why the government is freaking out so much over the NPA’s of the public banks? Theoretically, the government can just allot more banking licenses and new banks, each holding a decent amount of government bonds can rise up and fill up the credit needs of those whose balance sheets are good. For the NPA’s, do the standard bankruptcy proceedings, wipe out shareholders and sell away whatever assets are available and allocate as appropriate to the creditors. The hit on the balance sheets could be absorbed due to the extra demand in gov bonds due to the new banks. I don’t see the problem with the above listed solution. Why all the “bad bank” talk? Too many connected people would get hosed? As a development economist yourself, are you familiar with the work (books) by Ha-Joon Chang? Ravi, I am not familiar with Ha-Joon Chang’s work. However I did read a few pages from the introduction to “23 Things They Don’t Tell You about Capitalism”. It is clear that he (I guess he is a he) is against “free-market capitalism” and against neo-liberal economics. The trouble is that those terms are ill-defined. Douglass North wrote that he does not know what capitalism means and therefore does not use the word. I too. I understand what free markets are, however. Although I am trained in the neoclassical tradition (that’s the main stream in economics in the US), I later realized that I belong to the Austrian school. See this for a bit more of where I belong. Ha-Joon seems more like a protestant against the neoclassical orthodoxy. For me it was an eye-opener, since for too long I’ve been blinded by Milton Friedman’s free-market philosophy as the best set of economic practices for any country (developed or developing). Manufacturing (more broadly the ability to make quality stuff cheaply) is the bedrock of a nation’s prosperity. All economic activity is not the same, despite what comparative advantage says. There is a crucial difference between making high-tech industrial products vs. low tech labor intensive products and outsourced services. All the currently rich countries came to be so thorough massive protection of their industry (Hamilton’s infant industry protection proposal through high tariffs), yet neoclassical economists strongly advocate opening up the industrial sector of developing countries to foreign competition, no matter their current state (basically they are ‘Kicking Away the Ladder’). Shareholder value maximization is the dumbest idea in the world! (Chap 2 of 23 things). The wealth of a nation depends mainly on how much investment it makes in industrial productivity increases. Such investment usually takes a really long time to pay off. All capital/finance is not the same. Patient capital is necessary for industrial growth. The ideas are a critique of the neoclassical package as explained by Milton Friedman in ‘Free to Choose’, or more crudely put by Tom Friedman in his book of painful metaphors ‘The Lexus and the Olive Tree’, as the “Golden Straitjacket of economic success”. To fit into the Golden Straitjacket, a country needs to privatize state-owned enterprises, maintain low inflation, reduce the size of government bureaucracy, balance the budget (if not running a surplus), liberalize trade, deregulate foreign investment, deregulate capital markets, make the currency convertible, reduce corruption and privatize pensions. So, according the Ha-Joon the main reason India still is a poor country is not because we had (have) huge state-owned enterprises, a large bureaucracy, protectionism, etc., but because surpluses generated from industry were not sufficiently reinvested into improving technology (for example our rail locomotives and coaches have remained essentially unchanged from the 1960s). Look forward to your book, ‘Confessions of an Economic Fundamentalist’. You raise a number of points, many of which I only weakly agree with. I should first of all stress that I am a “free market” fundamentalist. But the meaning of the term is not universally agreed upon, and so I must define what I mean by a “free market” — a market in which all exchanges are voluntary, and in which there are no barriers to entry or exit. Each condition in definition is important. As long as those are met, it is a free market. If there is a free market, the outcome cannot be improved upon by an intervention. I don’t care if the market ends up having monopolies, duopolies, any degree of competition, etc, etc. I don’t care about scale economies, about fixed costs, stranded costs, etc etc. What I am interested is in the process, not the outcome. I don’t care if the intervention in the market is from saints, from evil overlords, from politicians, bureaucrats, SJWs — all intervention is bad. I can defend my position using simple economic reasoning, and don’t have to rely on any economic models. The models are alright as expository devices but they play second fiddle to economic reasoning when it comes to the matter of explaining the why of economic questions. I largely agree with Milton Friedman even though I am critical of the methodology of neoclassical economics. I find a home in the Austrian school, particularly in the Hayekian tradition. I have concluded that economic reasoning matters, the process matters (this one from James Buchanan), constitutions matter, and contracts matter. My academic training was in development economics. I have thought long and hard about India’s economic backwardness. I would not accept Ha-Joon’s analysis (as stated by you above). Why is India poor? The answer depends on whether one is interested in the proximate causes or some ultimate cause(s). Certainly, one has to stop somewhere reasonable in the search for ultimate causes so as to not end up at the Big Bang initial conditions as the answer. The answer “because surpluses generated from industry were not sufficiently reinvested into …” clearly comes nowhere close to some ultimate cause. My answer is that the rules, the institutional structures that arise from those rules, and the behavior that is motivated by them lead to the problem of poverty. All the rest about balancing the budget, reducing bureaucracy, trade and industrial policy, yada yada, are comparatively irrelevant and immaterial compared to the rules, and the processes and institutions that those rules give rise to.